With an unique combination of our Coalescing plate technology inside a pressurized separator as crucial pre-separation stage upstream of (2) polishing vessels the series PW-100 is able to remove suspended solids and both free and non/emulsified hydrocarbons. The combination of technologies makes the system unique in his kind, simple, robust and operator friendly. The high efficient pressurized pre-separation stage allows the waste water to be treated continuously even when there are slugs present. Depending on the type of water the operator can decide to use KD’s granular Absorption Media Cartridges for the removal of total petroleum hydrocarbons from water. The SERIES FS700 filtration skids are designed to filter particulate from liquids and in addition can be converted to remove hydrocarbons from liquids by using KD’s world’s leading granular Absorption Media Cartridges for the removal of total petroleum hydrocarbons from water. The Dual Vessel Absorption cartridge units are designed to be a portable complete filtration system and can be easily into service with little more than upstream and downstream connections being made. The filtration skid is designed and build to process specifics for the required flows and micron retain age. By Maintaining absolute fluid cleanliness, end- users can dramatically increase the life of critical wear components on rotational equipment, minimizing downtime and maximizing profitability. The filtration skids are offshore proof and equipped with all necessay valves, safety features and allows operators to simultaneously filter with one vessel and change out cartridges in the other vessel. All according to the latest design codes. KD's Oil Water Separator is a gravity separation device designed by using Stokes Law to define the rise velocity of oil droplets based on their density and size. The design of the separator is based on the specific gravity difference between the oil and the wastewater. KD International offers an extensive line of Mobile Oily Water Separators that bring both efficiency and low maintenance. 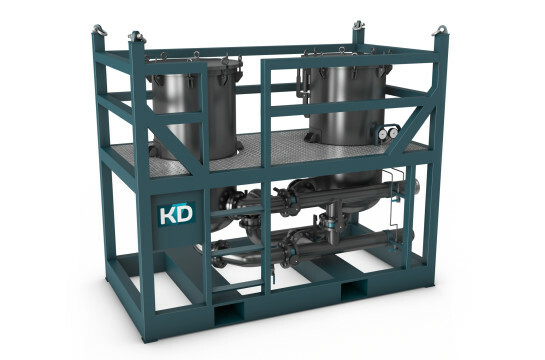 With some unique innovations KD´s Oil Water Separators, make the design highly efficient, easy to maintain and suitable for the demand of each individual client and application. Our unique design and technology makes KD's Oil Water Separators the preferred choice for the following applications; (1) Oil Spills on seas / oceans (2) Oil Spills on rivers / lakes (3) Oil Spills in groundwater (4) Oil Spills in harbours (5) process waters (6) overboard water. 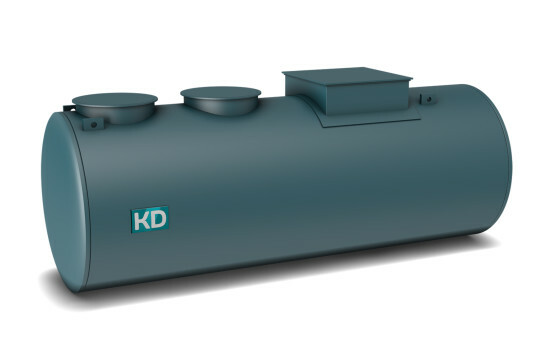 KD International supplies engineered coalescing oily water separators for installation inside new prefabricated or to retrofit existing concrete tanks. Our technology can be installed inside existing above or below ground round, square or rectangular tanks. 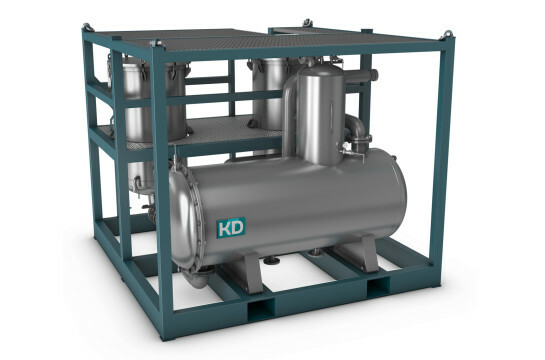 KD´s oily water separators separate free non emulsified oil, hydrocarbons, diesel, gasoline, fuels, from water to below 5 parts per million (ppm). The KD´s oily water separator design can be sized for any flow rate desired in single or multi channel designs to accommodate facility shutdown and maintenance activities without stopping the flow. A wide variety of configurations and features can be provided. When compared to traditional API oil water separators, KD´s separators provides higher oil removal performance and greater efficiency. 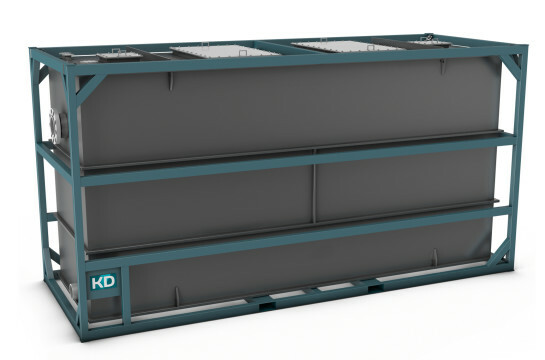 KD International supplies a complete line of cylindrical below-ground, steel oily water separators for stormwater and wastewater applications. These high performance units are custom fabricated to meet and exceed the strict construction and performance criteria. 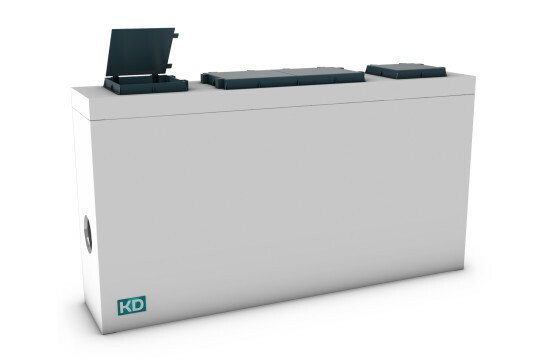 KD´s separators are fabricated in carbon steel and available in single-wall and double-wall constructions. KD´s below ground oily water separators can be designed with leak detection systems and passive cathodic protection systems to protect the steel tanks in the ground. Optional our separators can designed with additional corrosion protection package. With our unique design KD´s separators are suitable for large flow rate´s and are available with a variety of influent and effluent product handling options.